Are London mayor candidates making the most of the opportunities on Google? The London Mayor election has prompted significant online activity, but with 14 days to go could the candidates be doing more with Google? The starting point for many people searching for information online is Google. 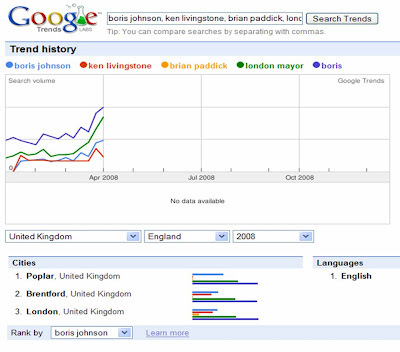 Using Google Trends it is possible to see the depth of searching around the London Mayor election. Users are searching for generic terms like 'London Mayor' as well as candidate names and volume of searching is increasing as the election nears. On this data Boris Johnson is evidently far ahead of the other candidates in terms of voter interest and awareness - could it be that Google Trends data is a better indicator of voter intention than the opinion polls and the race is not as close as we think? So how should candidates be using this data and how can they take advantage of Google in the run up to polling day? The volume of relevant searching on Google gives the candidates opportunities to show messages and ads alongside users' search results. Ken Livingstone is using Paid for Search on Google and to a lesser extent Brian Paddick is also pursuing this strategy. There is no geo-targeting applied to Ken Livingstone's ads - they are showing all over the UK. If he was to introduce London only targeting it would cut down on wastage (ie advertising to people outside London who can't vote) and would make the budget go further. With this increased budget it would then be possible to widen the list of keywords used. Currently targeting is aimed purely at terms associated with the election, however there is an untapped opportunity to position specific policies alongside relevant searches. I would have thought it productive to run ads alongside user queries such as 'London Crime', 'London Bus', 'tube', 'Oyster Card ', 'London environment' etc? At the same time, Boris Johnson does not have any Search Engine activity at all and I think his campaign is missing a trick by not advertising on Google through Google Adwords. Boris has the most impressive website, a well developed social media plan (including Facebook , YouTube and Twitter) and could really make the most of his online presence by driving traffic through a well thought out Search Engine strategy. As polling day approaches more and more Londoners will be searching online for information. With the polls as close as they are and rivals targeting his name, I am not sure Boris can afford to continue to ignore the advertising opportunities that Google and the other Search Engines offer?